Lance Corporal 39786 Arthur George Wyllie, 3rd Battalion, Worcestershire Regiment. 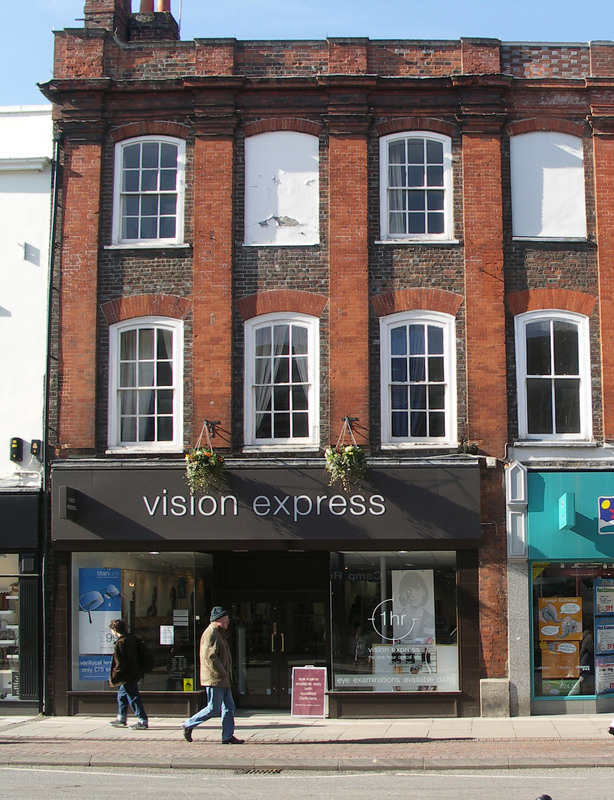 92 Northbrook Street, Dr Wyllie's home and surgery - now a branch of Vision Express..
Arthur was born in Newbury in March 1896, the last child of Robert Gill Wyllie and his wife Georgina Ruth. He had five elder siblings: Adeline (born 1889), Isabella Ruth Gill (1890), Wilfred Robert (1891), Edith Gladys (1893) and Dorothy Kate (1895). Their mother died on 20 November 1900 when Arthur was only four years old, his father, who would not remarry until after his children were grown, was left to raise them alone. Robert and Georgina Wyllie were Scots, from Aberdeenshire; Robert came to Newbury to practice as a doctor at 92 Northbrook Street; fortunately his income was such that he could afford servants, making the day to day issues of bringing up children a lot easier. Arthur was educated at Newbury Grammar School (1909-1911), where he excelled at swimming, winning four events at the opening games in the new school pool. After he left school he worked for Day & Porter, auctioneers and valuers with offices in the Market Place, Newbury. 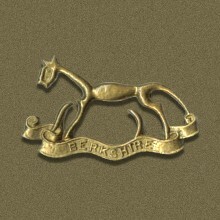 Arthur enlisted soon after war was declared in August 1914 opting to join the local Territorial cavalry, the Berkshire Yeomanry (regimental number 2213). As a new recruit he was not posted to the 1st/1st Berkshire Yeomanry who left for Egypt in March 1915 (and subsequently to Gallipoli and Palestine). He remained in England, probably with the 3rd /1st reserve/training regiment. Cavalry were trained as much as mounted infantry as horse soldiers and Arthur found his metier as a ‘bomber’. At that date bombers were not heavy aircraft but infantrymen trained in the use of one of the key weapons of trench warfare – the bomb or grenade. This was an expertise that was much in demand on the Western Front, far more so than cavalrymen. 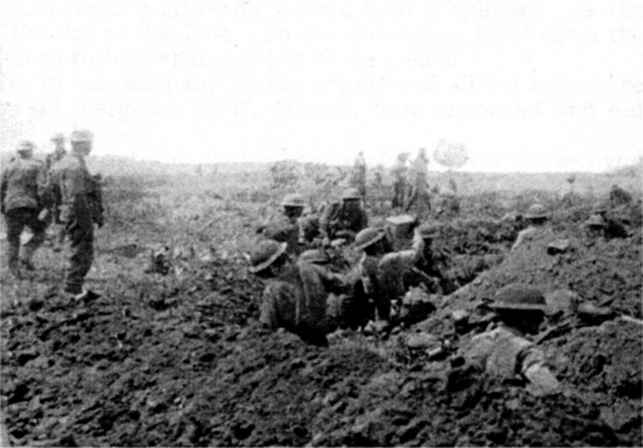 In September 1916, following the losses on the Somme, the various units of the second line Yeomanry (Territorial cavalrymen) were each ordered to provide drafts of 160-200 men as reinforcements for infantry battalion denuded by casualties. The Arthur was among the men selected from the Berkshire Yeomanry (as was another of Newbury’s fallen, Frederick Sawyer). The men were given a few days embarkation leave, kitted out as infantrymen and sent to an Infantry Base Depot in France from whence they were distributed to battalions in need of men. The former Berkshire Yeomanry men were split between the 2nd Battalion Royal Berkshire Regiment and the 3rd Battalion Worcestershire Regiment. Arthur and Frederick Sawyer were sent to the 3rd Worcesters. 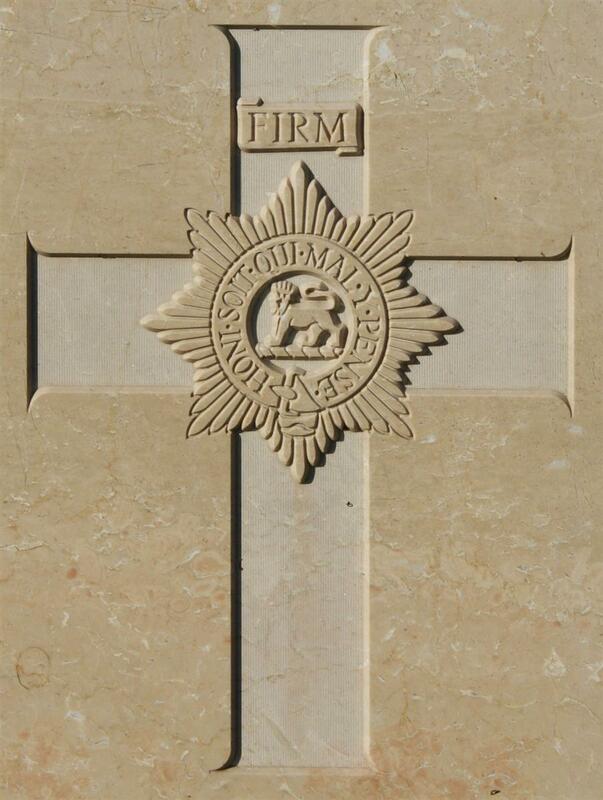 The regimental badge of the Worcestershire Regiment, as used on CWGC headstones. It is not known precisely when or how he was wounded, but it probably happened during the battalion’s involvement in the Battle of Messines Ridge on 7 June 1917 – though it is also possible that he was wounded in a subsequent spell manning the line on the Messines Ridge. As a bomber (grenade thrower) he would take a key role in the capture of enemy trenches and be very much at the ‘sharp end’ of the fighting. Whenever it happened he was wounded in the thigh and his leg was broken. He was evacuated through the chain of medical facilities that served the front, ending up at a Base Hospital in Rouen (several of these major hospital facilities were located in the city). Dr Wyllie, of Newbury, has had news that his second son, Arthur, is now in a hospital at Rouen, suffering from a compound fracture of the leg and a severe would in the thigh, which was sustained in the recent advance. Corporal Wyllie joined up at the beginning of the war in the Berkshire Yeomanry, and for some time was stationed at Bearwood, He became a bomber, and was afterwards sent to the East Coast, going to France last year. He was attached to the Worcestershire Regiment as a bomber, and had considerable service in the recent operations. He writes cheerfully, and hopes to get home soon. Dr Wyllie’s eldest son is employed as a despatch rider, his headquarters being Boulogne. their objective on Messines Ridge. Last week was recorded the sad news that Corpl Arthur Wyllie, the second son of Dr H G Wyllie was in hospital at Rouen wounded. Unfortunately on Monday morning a wire was received from Rouen saying that he had died from his wounds. He was a bomber attached to the Worcestershire Regiment, and took part in the recent successful advance. He was badly wounded with a broken leg, and a severe wound in the thigh. On June 15 he was well enough to write a cheery letter to his family at home, but on June 21 a letter was received from the Matron of the Hospital saying he was dangerously ill, and the wound in the thigh would not heal up. On Monday morning a wire was received in Newbury, saying he had died from his wounds. A letter written on Friday, afterwards arrived stating that the wound was very much worse and that the leg was amputated above the knee. Those are all the details received by his friends of his wound and subsequent death. His brother Wilfred, who is in the Red Cross Service at Boulogne, was going to see him on Saturday, and it was hoped he was able to arrive in time. Arthur Wyllie was 21 last March, and his death is a terrible blow to his father and sisters. Before the war he was employed by Messrs Day and Porter. He was educated at the Newbury Grammar School, and was generally liked, being a quiet unobtrusive youth, who was a great favourite with his friends. He joined up at the beginning of the war in the Berks Yeomanry, and specialised in bombing. He went abroad during last year, and gained his stripes for meritorious service. WYLLIE – June 23, died of wounds in France, Corpl Arthur George Wyllie, 3rd Worcesters, younger son of Dr R Gill Wyllie, of 92, Northbrook-street, aged 21 years. Dearly loved and deeply mourned. With most sincere sorrow we have to announce the death of Corporal Arthur Wyllie, Worcestershire Regiment, from wounds received in Flanders. Joining up at the beginning of the war in the Berks Yeomanry, he specialised in bombing practice, and was attached to the Worcesters, with whom he went to France, where he gained his stripes for noteworthy service and where he now lies dead. Thus another link with the life of the School has been broken. Although he left the School at an early age, he had already gained prominence for himself as a swimmer, winning most of the laurels on the occasion of the first sports at the opening of the School Baths, and by his death he has left a lasting name for himself on that all too rapidly increasing roll of dead heroes of the School “Who gave their all and counted not the cost.” We can do nought but endeavour to console the mourning relations with the glorious cause in which he gave all that was noblest and best in him, his life, to be sacrificed that his country might not die, and offer our most profound sympathy in this, their hour of sorrow. 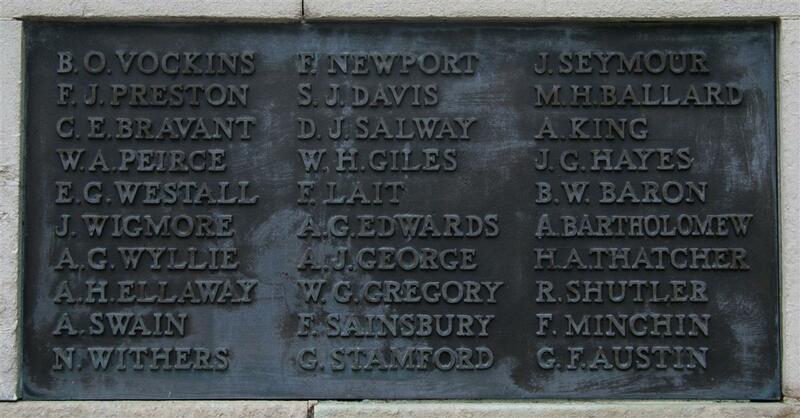 Arthur's name on Newbury War Memorial. Arthur was buried in grave P. II. I. 4B at the massive St. Sever Cemetery Extension, Rouen. This cemetery contains many thousands of allied casualties, most of whom perished in one of the Base Hospitals. In Newbury he is remembered on tablet 4 of the Town War Memorial as well as the roll of honour (as A G Whyllie) and memorial board in St Nicolas’ Church. He is also commemorated on the Newbury Grammar School Memorial at St Bartholomew’s School and on the gravestone marking his parent’s grave in Newtown Road Cemetery.